DALLAS Semiconductor, represented by Arrow Electronics , has introduced the DS1087L spread-spectrum EconOscillator, the first 3V single-chip oscillator. 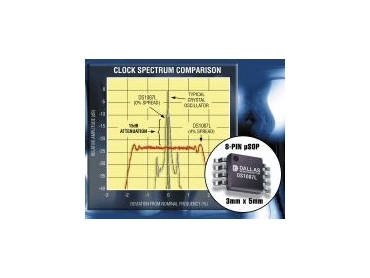 This fixed-frequency device requires no programming, and with either a 2% or 4% dithered output, the DS1087L reduces EMI up to 20dB relative to crystal oscillators. The DS1087L EconOscillator is a clock generator that produces a spread-spectrum (dithered) square-wave fixed output of 260kHz to 133MHz. This one chip replaces your crystal or crystal/oscillator and reduces radiated-emission peaks by dithering the output frequency 2% or 4% below the operating frequency. The DS1087L has a power-down mode and an output-enable control for power-sensitive applications. This device comes in an 8-pin microSOP that is pin and layout compatible with previous and future EconOscillators.